Joomla 1.6 is now supported! 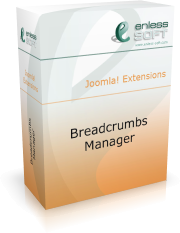 Breadcrumbs Manager is a native Joomla 1.5 and Joomla 1.6 extension that allows you to manage the breadcrumbs(pathway) displayed in your web site. Breadcrumbs Manager is a simple, yet flexible breadcrumbs management system that is not bound to any particular Joomla component. Management is done using standard Joomla-style administrative interface. The existing Joomla breadcrumbs module is used for the frontend, thus you don’t need to recreate the design for a new module. Breadcrumbs, sometimes also called "pathway", is the user interface element that shows the user’s current location in the web site. As you can see, it shows you what you are currently reading ("Football derby cancelled") from the Sport news category. "Home", "News" and "Sport" are actually links that give you the ability to quickly go to a parent category of the currently displayed page. As a side effect, breadcrumbs give the user a clearer understanding of how a web site is structured. How can Breadcrumbs Manager help me? Joomla CMS does not currently provide a way for an administrator/manager to control the breadcrumbs, displayed in the web site. A module for displaying breadcrumbs exists, but what it displays cannot be configured anywhere. Some Joomla components, however, work with breadcrumbs by adding items. Although in rare cases this might be sufficient, it is more likely to result in non-clear, less user friendly breadcrumbs interface element. Breadcrumbs Manager provides a way to fully control how breadcrumbs are assembled.